Fact Sheet: Meet Us If You Want Ticket! There is severe competition for tickets in almost all the leading political parties in Telangana. 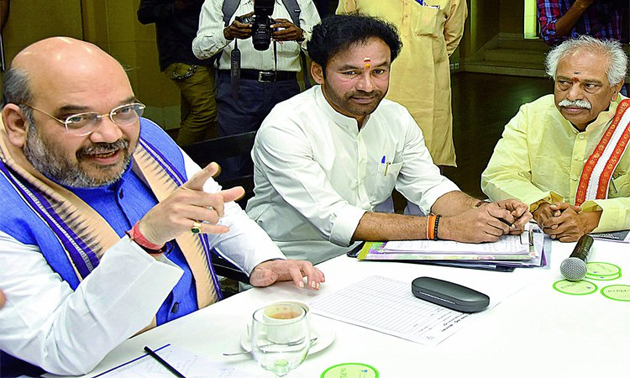 More than two aspirants had competed to bag the ticket of TRS, Congress, TDP, TJS and CPI. Unfortunately, The situation of BJP which claimed it would field candidates in all the 119 Assembly Constituencies is pathetic. BJP Leadership isn't even able to find candidates within the party in more than half of the seats. Saffron Party is now waiting for the leaders who are migrating after the denial of tickets to field candidates in all the segments. If the media reports are true, BJP Leadership is holding talks with the Rebels of TRS and Mahakutami. Mallaiah Yadav who aspired for Kodad Congress Ticket was welcomed by BJP with an assurance on the preferred seat. BJP offered Mahabubnagar ticket for TJS Leader Rajender Reddy. Leaders like Babu Mohan who were neglected by TRS and Mahakutami are accepting the tickets offered by BJP to stay in the contest. In reality, The National Party could find it difficult to retain even the 5 seats it won in 2014. Balayya & Kalyanram Got Ready! What About Jr?